Hey there, welcome to my Christmas home! I’m so excited for you to join me for my very first Christmas Home Tour. I was so thrilled when my friend Jen from Migonis Home invited me to be part of her fabulous tour. Make sure to check out the other stops on the tour in the links at the bottom of the post! If you are dropping by for the first time, I’ll just introduce myself quickly- my name is Nina. 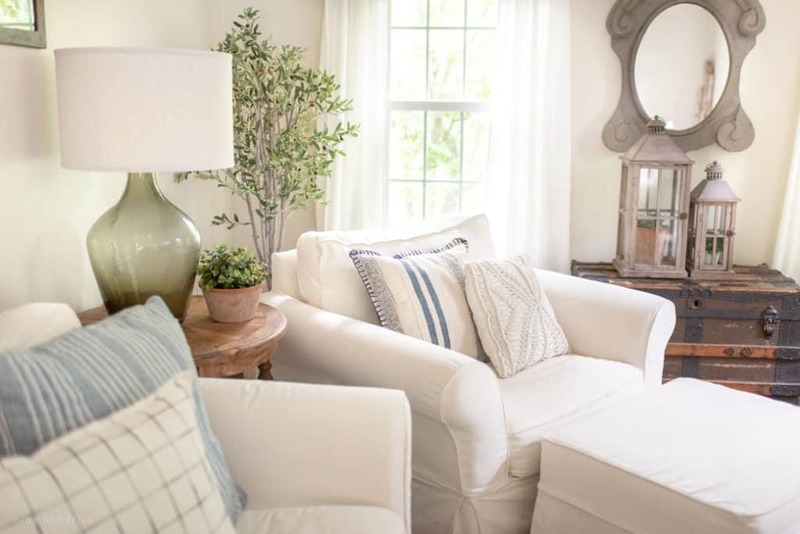 I am a New England girl, and my very handy husband Mack and I are transforming our cookie-cutter 1980s colonial into a DIY modern farmhouse. We have two little boys named Logan and Cooper, a golden retriever named Lucy, and in a few short weeks (I can’t even believe I’m typing that!) we will be welcoming a baby girl to complete our family! So with that piece of information, it will probably come as no surprise that I’m currently in major nesting mode. Nesting for me seems to translate to be driven to complete projects that we had started all over the first floor. So today’s part of the tour will feature the rooms that aren’t currently under construction. I am also craving the cozy right now- so that has been the overall theme in my Christmas decor this year. I’m also a little homesick for New Hampshire, where I’m from originally- and since we haven’t been able to visit, I’ve tried to bring some of that rustic feeling into our Massachusetts home! This post contains affiliate links for your convenience. Please see my disclosures here. This may be one of my favorite displays I’ve ever created. My inspiration was the wooden deer I scored at Homegoods, and the rest evolved from there. The wooden star is from Target (now sold out, a thinner but similar version can be found here). 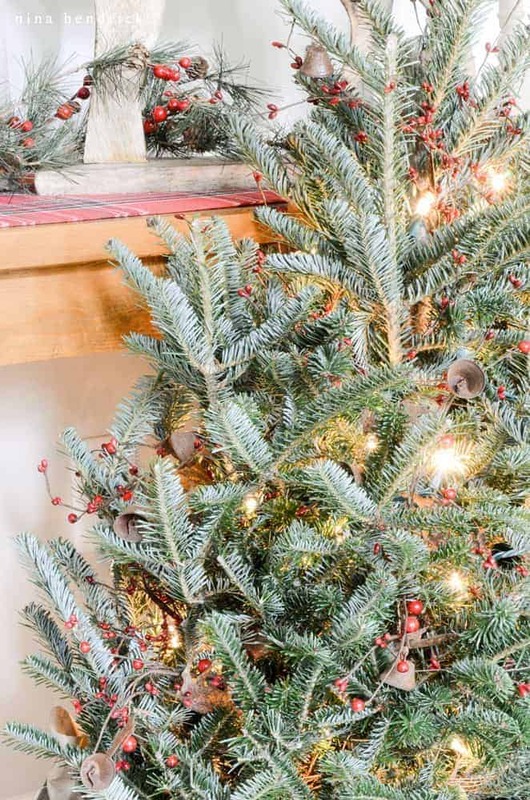 A live mini fraser fir is adorned with pip berries and faux-rusted deer and bell garland. So far this is our only Christmas tree, we’re a bit behind this year! The sign is homemade- and written in white sharpie, of all things. It was such a simple and quick project- just a piece of stained wood, tracing a clip art star, and some cursive. It’s hard to believe almost a year has passed since we completed our DIY Kitchen Makeover! 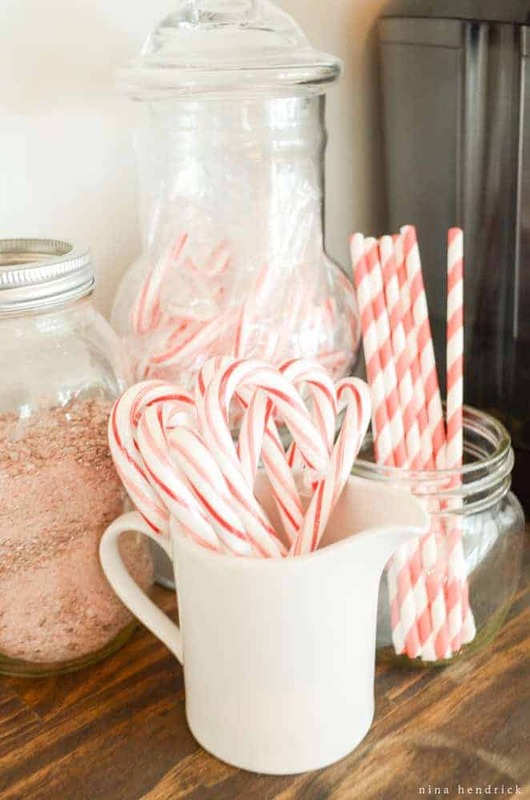 Since the kitchen is really the hub of our holiday entertaining, I wanted to make sure that there were some fun seasonal touches. 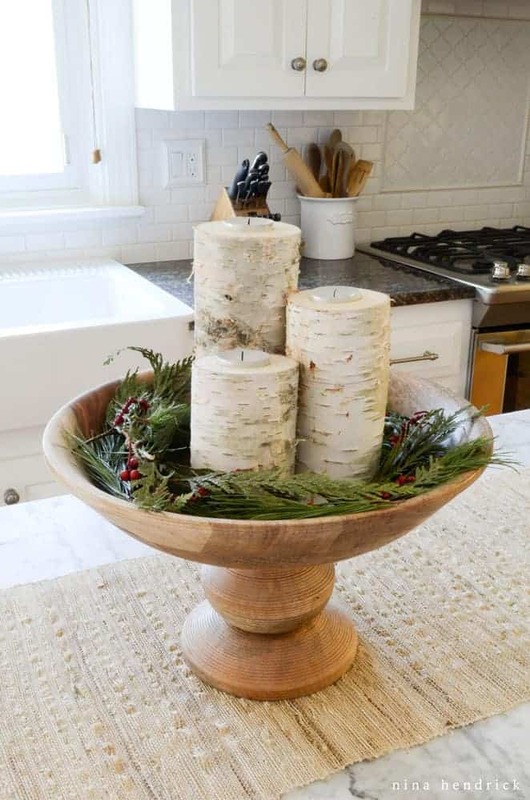 The Birch Candle Holders are a quick and easy DIY- I added them to a wooden bowl of evergreens and berries. Would you like some hot cocoa? This beverage cart was a recent build we shared over at Remodelaholic. 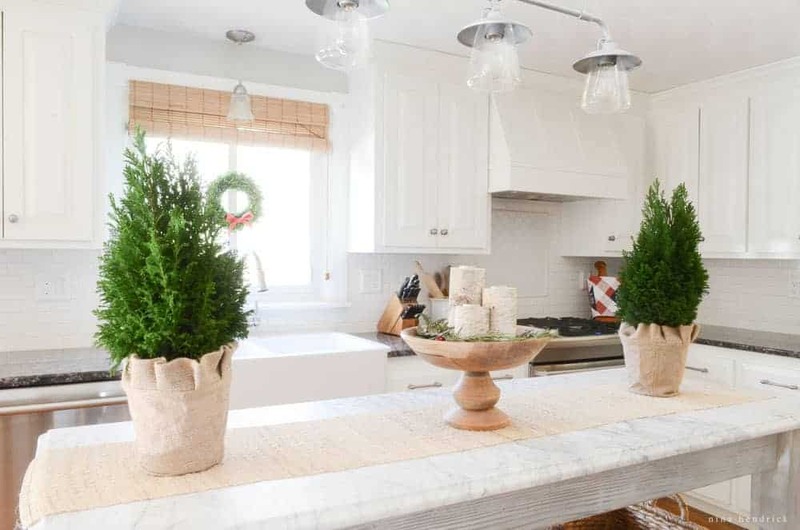 It has added some much needed counter space to our kitchen, and comes in really handy during holiday entertaining. 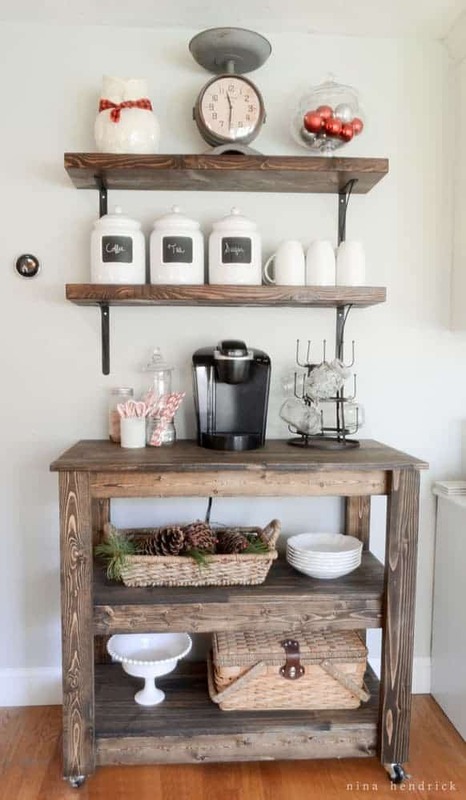 Our DIY Rustic Pine Shelves also got an update- they had started to warp, so Mack planed them and we gave them a new finish to match the beverage cart. The owl cookie jar is wearing a fun scarf for the holidays! 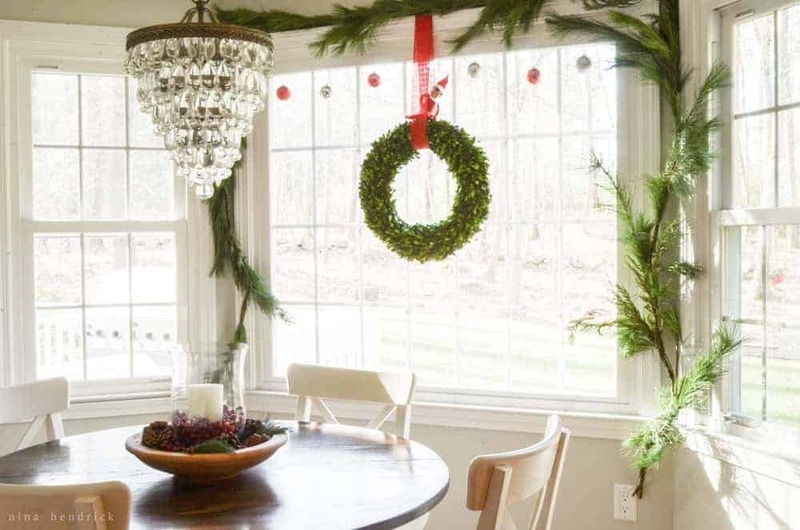 The breakfast nook is actually one of the next rooms we are going to tackle, but I wanted to dress up the window a bit for Christmas. You’ll notice that our Elf on the Shelf George made an appearance in the home tour- there was no good way to distract the boys while the lighting was perfect, so I figured I’d just go with it! 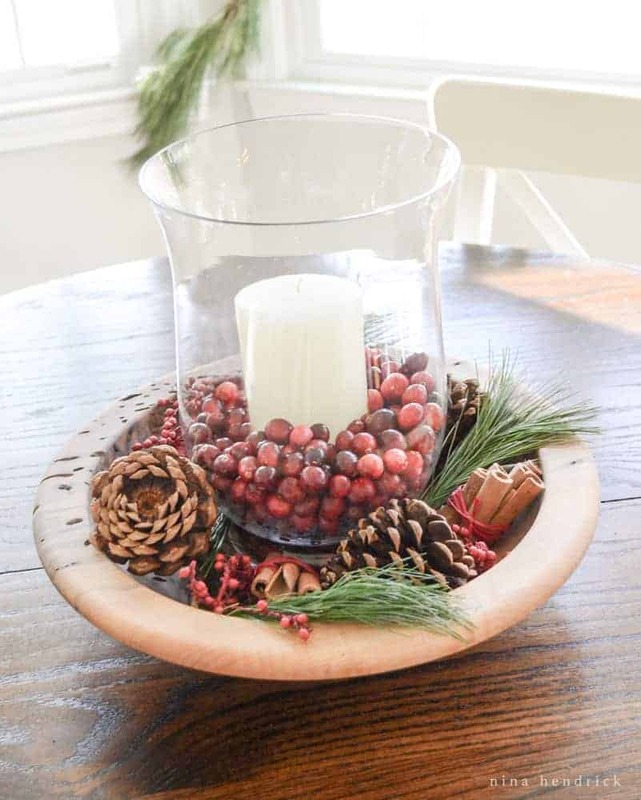 A simple white candle and cranberries sit in a wooden bowl that was a gift last Christmas from a sweet family friend named Bernie. He’s an incredible craftsman and makes these bowls as a hobby in his retirement. I fell in love with the bowl while I was visiting his workshop, and it magically appeared under my tree last Christmas. It must have been Santa! And that concludes my tour. I hope that you and yours have a wonderful holiday season! Grab a great big mug of coffee or hot chocolate and a comfy chair because I’ve got a treat for you… Come join these other incredible women as they show off their homes. I can guarantee that you will gain inspiration and ideas for your own home each day during this tour! Gorgeous! 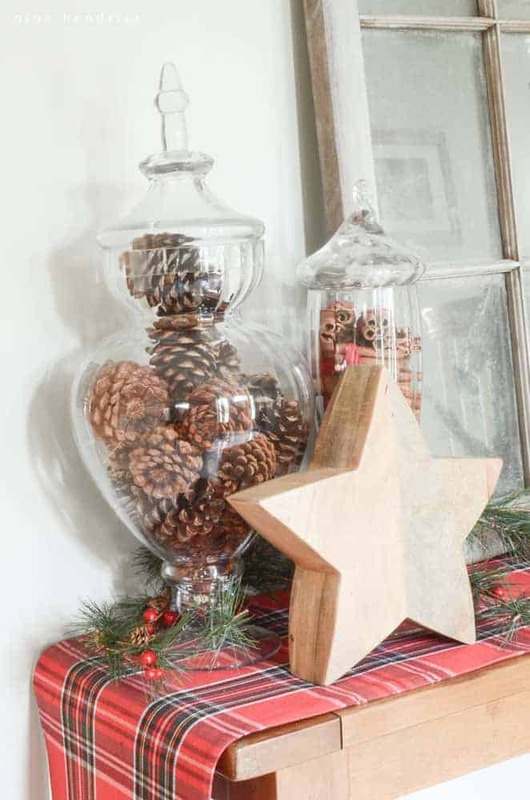 Love your home tour — so festive and I love the rustic touches. Visiting from Jen Rizzo’s link up! 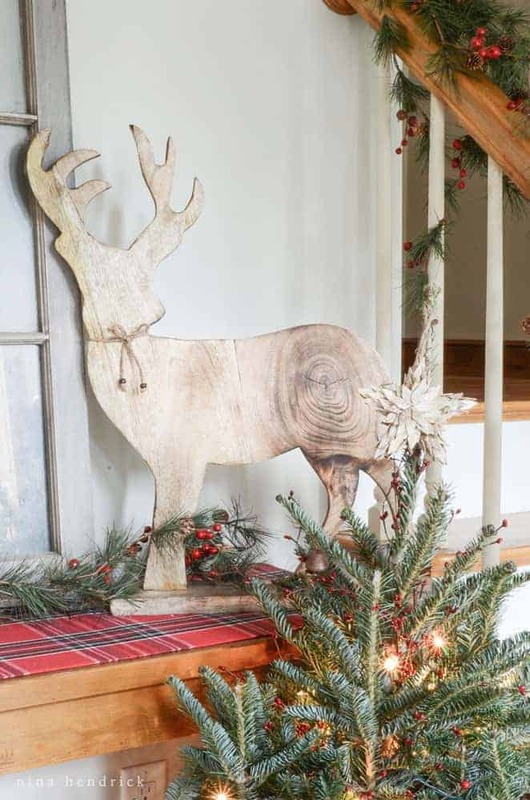 I am obsessed with that wooden deer! 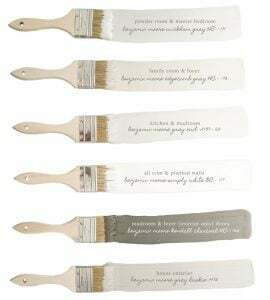 And your whole kitchen… swoon. Great job! So pretty, Nina! I echo what Rachel said about the kitchen. Totally want to come bake with the two of you there. :) And I love the shade above the sink… it’s great for adding in some texture and non-whiteness for all of those white haters from Elle Decor. HA! Can’t wait to see the rest of the house!!! I so want your hot chocolate bar, Nina! Gorgeous! Thank you for sharing your home with us for the holidays! 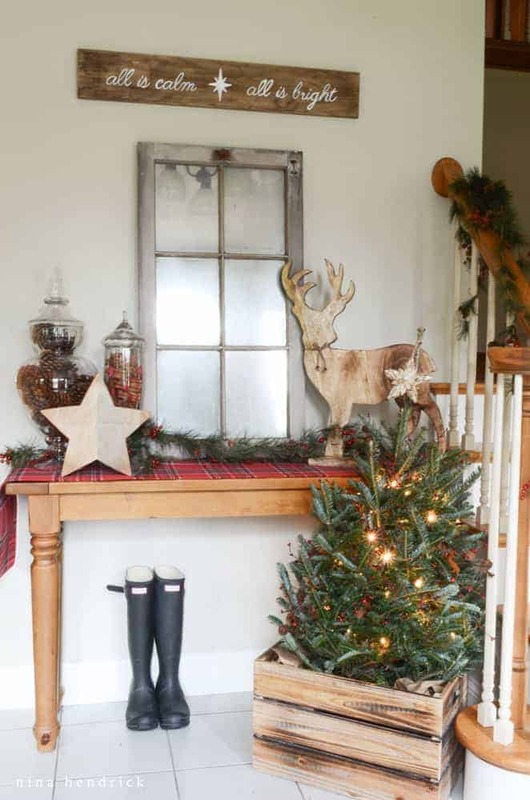 Love the rustic decor you have showcased on the Christmas Home Tour. Every detail is lovely. I enjoyed walking through! Happy Holidays! Really beautiful, Nina!! I love the rustic and natural elements and I always seeing glimpses of your beautiful kitchen!! Happy holidays, friend! 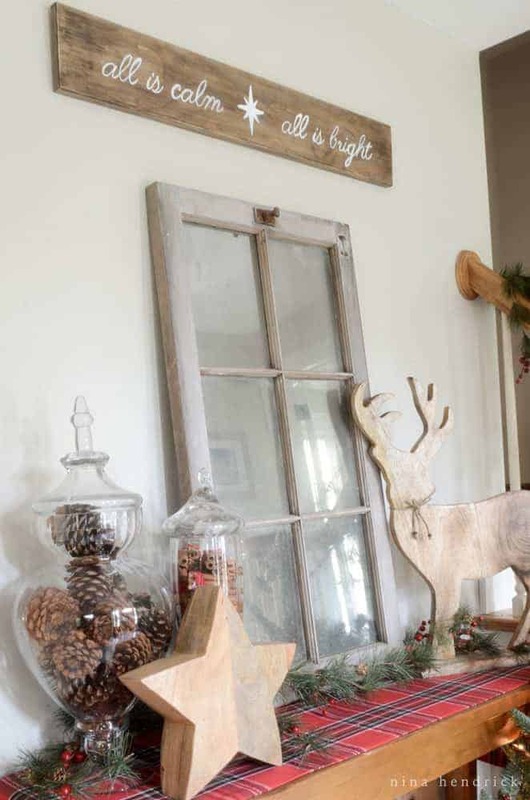 I love all the rustic touches with the wood – especially that deer! 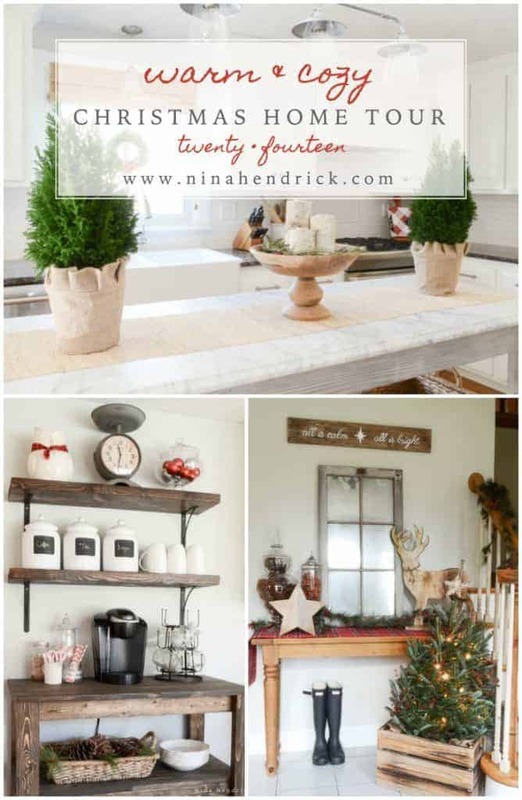 Nina, your home always looks gorgeous, and your holiday home tour is no exception! I always study the details of your beautiful kitchen!!! 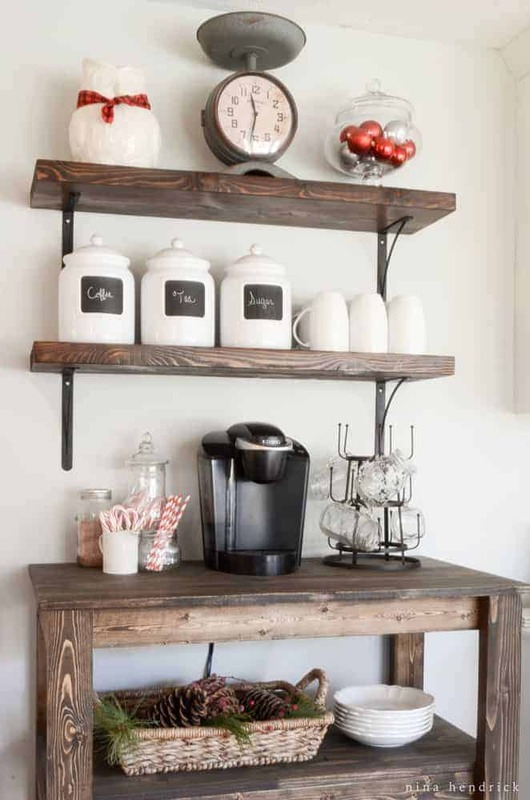 I LOVE that sweet sign in your foyer. 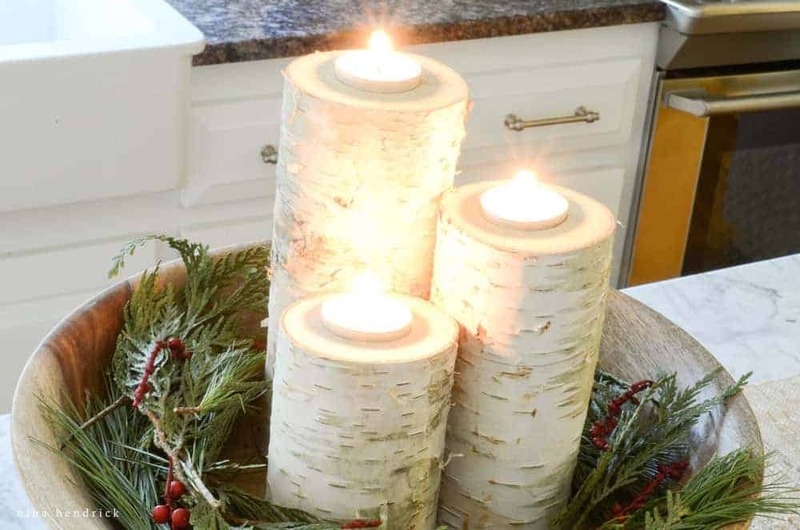 Also a big fan of those two trees and the birch candles in your kitchen. My mental project list has grown exponentially thanks to these holiday tours! !